Posted on April 13, 2018 at 5:51 pm. We had such an exciting week continuing to set up our hydroponic system. 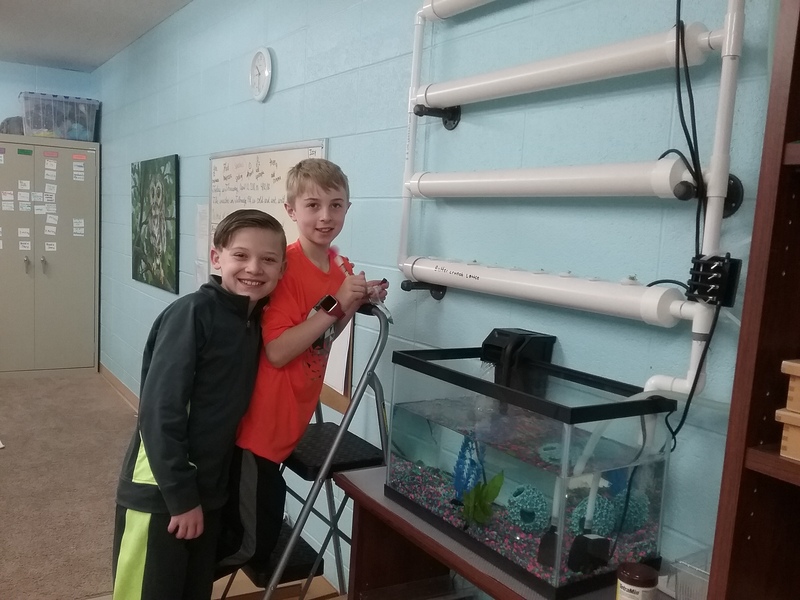 We added snails at the end of last week, more male guppies this week, and discussed how to tell if a female guppy is pregnant and when we need to separate her from the other fish to keep the babies safe. After germinating our seeds for about ten days, we were able to plant the seedlings into the foam and baskets to add to our hydroponic system! Our students labeled the baskets so we can keep track of what is growing. Our students are also planning to sell our plants to raise money to continue our system next year. 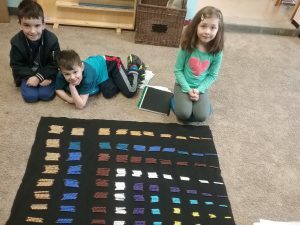 While all of the Montessori lessons are interesting and essential, it is always such a treat to see what projects students come up with, and complete, independently. Their confidence in their research skills, planning skills, and independence are amazing. Our first graders and visiting kindergarten friend worked on their multiples this week by building the Decanomial. This was their second lesson with the Decanomial. This time, they went through and found which equations followed the Commutative Property. 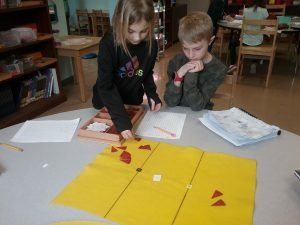 The third year students are working on multiplying fractions. This week, they began by multiplying fractions by a whole number. After some practice with this, students will learn how to multiply a whole number by a fraction, then finally a fraction by a fraction! These first year students are working with the Small Bead Frame. The Small Bead Frame can be used for adding and subtracting four-digit numbers. 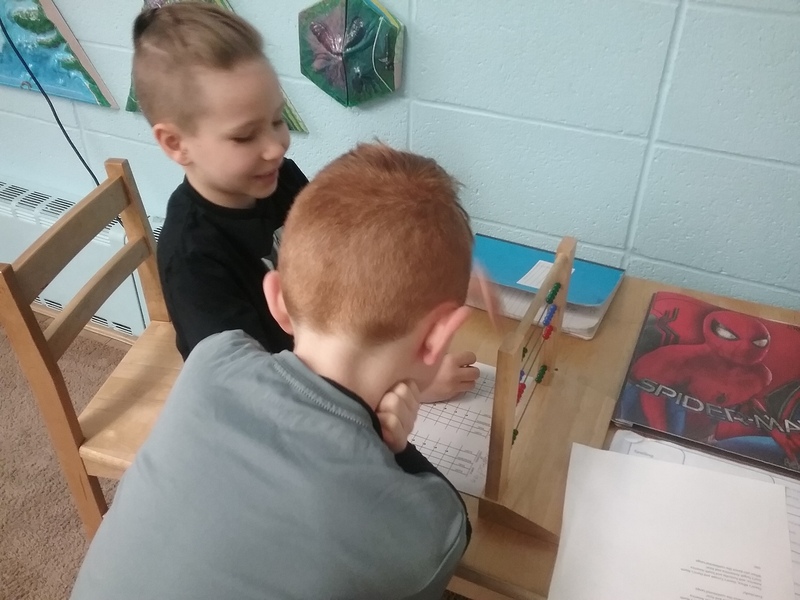 One of our first year students needed some help borrowing in his subtraction problem, so his friend came to help explain what to do! Students often learn better from their peers! This fourth year student was reviewing how to multiply a binomial by a binomial. 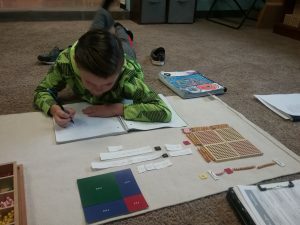 He noticed that the pattern, or order of operations, matched what he was doing with cross multiplying on the Checkerboard. Eventually, he will learn that this is the formula for the lid of the Binomial Cube he used as a primary student! Next week, first year students will be introduced to equivalency of fractions, the Conjunction Grammar Box, contractions, and parts of the leaf. Second year students will learn how to do compound multiplication on the Large Bead Frame and will continue studying commas and triangles. Third year students will take the volume of liquids, practice using quotation marks, and will learn more about the phyla in the plant kingdom. Fourth year students will continue studying decimals, early humans, and bacteria.